A.5.1. About half of Latinos say their family and friends make at least “a moderate amount of effort” to reduce global warming. The belief that people similar to you are taking action to reduce global warming can be an important motivator for taking action oneself. Cialdini, R. B. (2003). Crafting normative messages to protect the environment. Current Directions in Psychological Science, 12(4), 105-109., Doherty, K. L., & Webler, T. N. (2016). Social norms and efficacy beliefs drive the Alarmed segment’s public-sphere climate actions. Nature Climate Change, 6, 879-884. doi: 10.1038/nclimate3025 About half of Latinos (48%) say their family and friends make either “a great deal of effort” (4%), “a lot of effort” (11%), or “a moderate amount of effort” (33%) to reduce global warming. 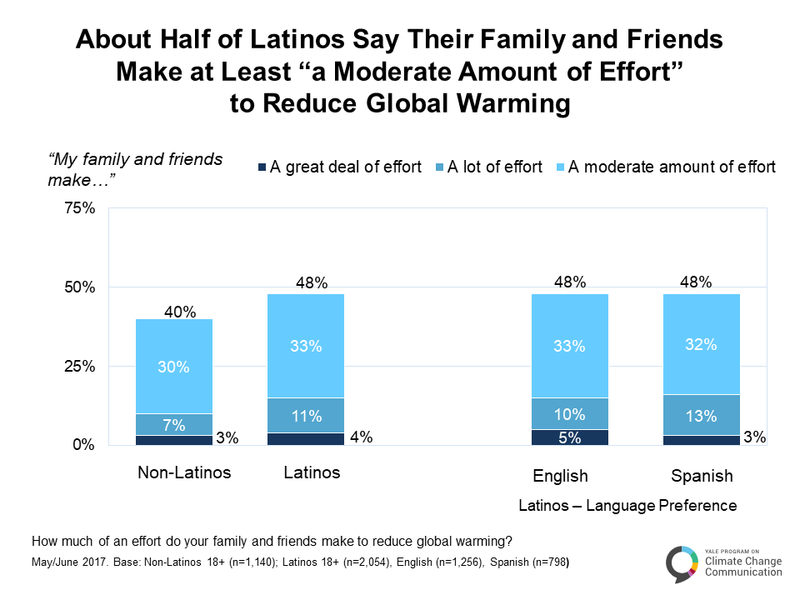 Fewer non-Latinos (40%) say their family and friends make “a great deal effort” (3%), “a lot of effort” (7%), or “a moderate amount of effort” (30%) to reduce global warming. A.5.2. 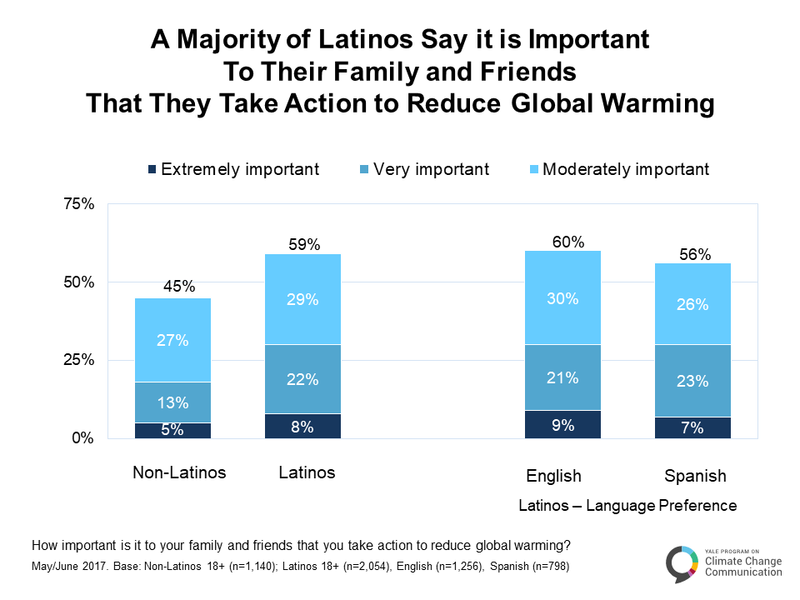 A majority of Latinos say it is important to their family and friends that they take action to reduce global warming. The belief that people want or expect you to take action to reduce global warming can also provide motivation to take action oneself.Schultz, P. W., Nolan, J. M., Cialdini, R. B., Goldstein, N. J., & Griskevicius, V. (2007). The constructive, destructive, and reconstructive power of social norms. Psychological Science, 18(5), 429-434. doi: 10.1111/j.1467-9280.2007.01917.x Nearly six in ten Latinos (59%) say it is either “extremely” (8%), “very” (22%), or “moderately” important (29%) to their family and friends that they take action to reduce global warming. By contrast, fewer non-Latinos (45%) say it is “extremely” (5%), “very” (13%), or “moderately” important (27%) to their family and friends that they take action to reduce global warming. A.5.3. 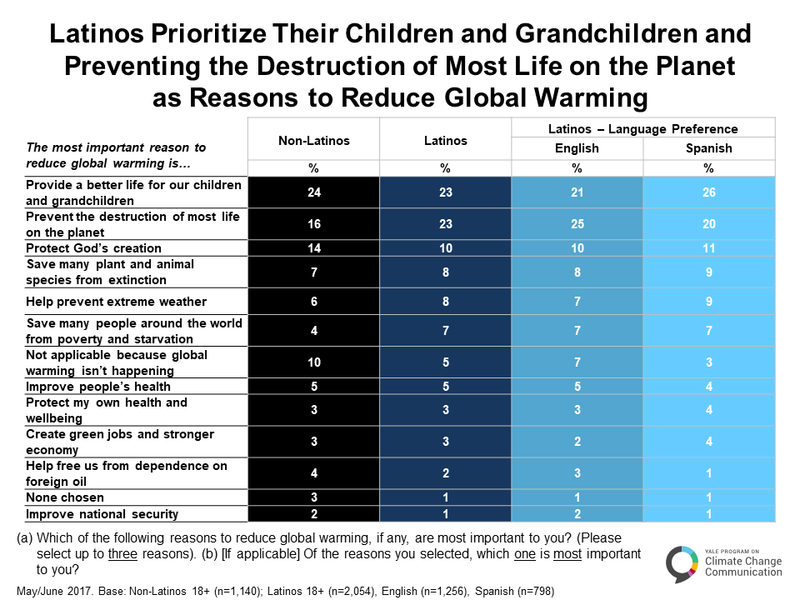 Latinos prioritize their children and grandchildren and preventing the destruction of most life on the planet as reasons to reduce global warming. Nearly one in four Latinos say either providing a better life for our children and grandchildren or preventing the destruction of most life on the planet are the most important reasons to reduce global warming (each 23%). One in ten Latinos (10%) say protecting God’s creation is the most important reason. Fewer say their most important reason to reduce global warming is saving many plant and animal species from extinction (8%), preventing extreme weather (8%), saving many people around the world from poverty and starvation (7%), improving people’s health (5%), protecting one’s own health and wellbeing (3%), creating green jobs and a stronger economy (3%), freeing us from dependence on foreign oil (2%), or improving national security (1%). Six percent either said this was not applicable because global warming isn’t happening (5%) or did not choose a reason (1%). Non-Latinos are less likely than Latinos to prioritize preventing the destruction of most life on the planet or saving many people around the world from poverty and starvation, but are more likely to prioritize protecting God’s creation. Non-Latinos are also more likely to say global warming isn’t happening. A.5.4. A Majority of Latinos think humans can reduce global warming, but few are optimistic that we will. Forty-four percent of Latinos say humans could reduce global warming, but it’s unclear at this point whether we will do what is necessary, and 31% say humans won’t reduce global warming because people aren’t willing to change their behavior. 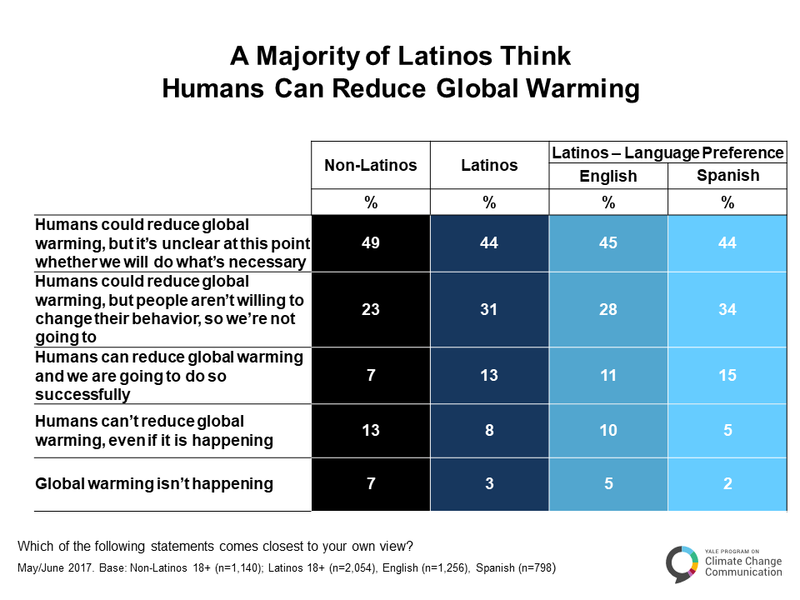 Thirteen percent of Latinos say humans can and will reduce global warming successfully – almost twice the number of non-Latinos who say this (7%). Only 8% of Latinos say humans can’t reduce global warming even if it is happening. Latinos are more optimistic than non-Latinos that humans can and will reduce global warming (13% vs. 7%), but are also more likely to think that humans could reduce global warming, but won’t (31% vs. 23%). Read the Next Section Online B.1. Should the U.S. Act on Global Warming?